After years of hype and promises of a self-driving future, Alphabet (Google's parent company) is putting the brakes on its most-ambitious self-driving car project, according to a report from The Information. Instead, the company will pursue a new strategy aimed at getting autonomous vehicles on the road, under the banner of a new Alphabet company called Waymo, which was announced at an event in California today. Moving self-driving cars out from under the auspices of Google X (where the project lived for eight years) and into own separate company is a big shift. In fact, if you look at the Waymo website or read its blog entries, the focus is less on building a consumer-facing product, and more on the software and lessons learned from getting self-driving cars on the road. Yesterday, The Information reported that Alphabet is no longer focusing on building its own self-driving car that would lack a steering wheel and pedals. Instead, it will partner with existing auto manufacturers to bring its self-driving tech to cars that have steering wheels. This is a big move for a company that once argued self-driving cars should never have a steering wheel, and that once promised to have self-driving cars on the roads by 2020. According to the report, Alphabet CEO Larry Page and CFO Ruth Parat made the decision to move away from building a car without pedals or a steering wheel after they determined the idea was "impractical." Moreover, after nearly eight years of work on the project, Google has very little to actually show for all of its efforts. Even worse, Google prototypes have given other companies — including Uber and Apple — ideas about getting into the car space. And legacy car makers have caught the self-driving bug too. For its next prototype, Google could do one of three things. The most ambitious would be to design and build a car end to end, like it did with the koala car. The second-hardest would be to work with an existing car brand to build a car that would incorporate the Google sensors and software as part of the manufacturing process, but not include a steering wheel or pedals — something that would require a not-insignificant amount of work on the part of the carmaker. 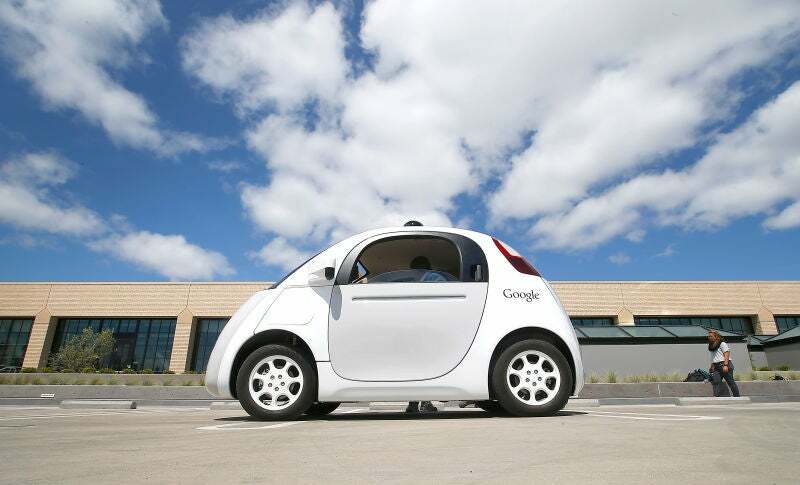 Or Google could work with a car brand to integrate Google tech into an existing vehicle model. Google opted to go with the last option, agreeing in May to partner with Fiat Chrysler to put Google tech into the automaker's SUVs. Google realised that building its own car would be difficult to do, especially at the scale needed to compete against companies who already have the assembly lines and manufacturing facilities. This is a lesson Apple has reportedly learned too, with its own car efforts shifting from making its own car to focusing on the software that would power self-driving cars. As other tech companies have learned this year, building your own car is hard. A focus on software and partnering with existing manufacturers will potentially put Google head-to-head against Apple in yet another product category. The Information also reports that Larry Page is going to move the self-driving unit out of Google X — the division for "moonshots" — and into its own separate company within Alphabet. The broader strategic change allowed the leaders of Chauffeur, as the self-driving unit is known at the company, to consider launching a commercial ride-sharing service with autonomous vehicles by the end of 2017, according to two people with direct knowledge of the internal discussions. Whether Chauffeur can launch what is called a "robo taxi service" in that time frame depends on the performance of a new self-driving car prototype manufactured for Google by Fiat Chrysler. The first of the prototypes were due to be in Chauffeur's hands by the end of this year. If all goes well, there's an option to boost production of the autonomous car, an electric hybrid "Pacifica" minivan that retails for more than $US42,000 ($56,032) without the extra Google hardware and software, into the hundreds of vehicles, says one person briefed on the deal. The cars could then be used in the new service. It's not clear if this self-driving car service is related to the rumoured Uber-competitor that Google is already reportedly working on. Uber is also working on its own self-driving ambitions, and its first fleet of self-driving test cars launched in Pittsburg back in August. Of course, creating its own self-driving car service presents challenges too. Not only does Google need to convince automakers to install its software (the same way it convinced phone makers to install Android), it will need to hope those companies don't also have their own plans for ride-sharing. And once it does that, Google will still need to build its network from the ground-up. And that doesn't even get into the logistical challenges of actually piloting markets and getting self-driving cars on the road. With all of these uncertainties, that 2020 "goal" seems less and less likely. There is some good news in The Information's report: Google's partnership with Fiat Chrysler has been going well. The first priority now is to get vehicles with that software on the road so Google can get more self-driving data to make its software even better. And with any luck, some day, we'll actually see that software on fully autonomous cars on our roads.